In a blender, add the egg yolks, milk, water, flour, sugar, vanilla, melted butter, nutmeg, and salt. Blend for about 1 minute until smooth. Refrigerate until ready to use. Make the sauce, recipe below. To make the crepes, heat a crepe pan or a 7- to 8-inch skillet (non-stick works nicely) over medium heat, and add a touch of butter to coat. Pour out a thin layer of batter into the center of the pan. Tilt and rotate the pan immediately after pouring (or while you’re pouring) to cover the bottom of the pan. Cook the crepe until the under side is lightly browned; carefully flip and cook the other side. 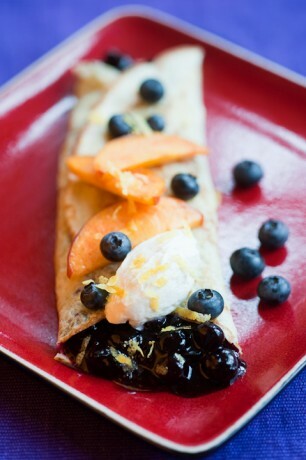 To serve, add a ladleful of blueberry sauce down the middle of the crepe. Fold one side over the center, then the other side. Serve immediately. In a medium saucepan, combine the blueberries, cornstarch, honey, lemon, and cinnamon. Bring to a boil, then simmer for 5 minutes on low, covered, until a nice blueberry sauce forms, with blueberries visible and a slightly thickened sauce.